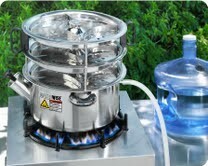 The Model 1600 is a non-electric water distiller that can be operated on a variety of heat sources: electric stovetop, hot plate, propane or natural gas burner, wood or coal burning stove, gas or charcoal grill, etc. Ideal for day-to-day use or emergency situations, such as: power outages, natural disasters, or backup for electric distillers. Water is heated in the stainless steel boiler to 212° F (100° C) killing microbes such as bacteria, cysts and viruses that may be present. Steam rises leaving behind dead microbes, dissolved solids, salts, heavy metals and other substances. 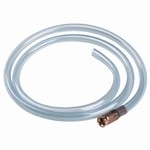 Low boiling light gases are discharged through the gaseous vent. Steam is condensed in the three-level stainless steel tray assembly. Purified distilled water is captured in the collection cup assembly. The 100% steam distilled water flows through the collection tube into the 3.2 quart stainless steel collection/storage container (included). An all stainless steel distiller designed to consistently and effectively provide pure steam distilled water . Light weight and portable, it is suitable for travel, camping, or any emergency situation. The Waterwise distiller works with standard household electricity or in the event electricity is unavailable, the Waterwise can be used as a stove top distiller, or with any alternative heat source hot enough to boil water. including directly into water bottles. Easy to clean with no moving parts, the durable unit is fully portable with dual fuel capabilities. A countdown digital timer is included for trouble-free monitoring. 12" H X 12" D, weighs 9 lbs. 2 year manufacturer's warranty.